Alen has just done it for a second time and created a good air purifier for those on a budget. When I say a budget device from Alen, it is a device without many fancy features, but there are many reasons to set it up in your home. Why? You need to read our Alen T500 Review to know the answer. Standing in the line of American air purifier brands, Alen is one knowledgeable air purifier expert that mostly focuses on the customer services, not just the products. In an era that the best customer services win, Alen is the first to deliver a lifetime warranty. But back in the performance, our today Alen T500 is a budget device which undeniably comes in a dire battle that only ends well for the best air purifiers. Get ready for our Alen T500 Review to know more. Alen had a happy year thanks to the release of their new flagship – the Alen BreatheSmart 75i. But back to many years later, this brand has a good product line of tower air purifiers, which is trusted by many customers for the price – the T100 and T300. Now both of them are discontinued by the company, so they can improve and focus on the latest device – the Alen T500. This is also one compliment, because other American brands like Honeywell and Guardian Technologies are still keeping their old models. It’s hard to keep track for new updates and the availability of the very old models, so I love Alen for not being too greedy. The American brand brought out the Alen T500 with an even more attractive price tag than the predecessors. In Breathe Quality, we believe that is a smart move from Alen. Despite of the perfect customer services, a $300 tower air purifier needs much more to be profitable. With only $199 in Alen website, the Alen T500 is more practical to buy. This air purifier is mostly to extend the customer base to those who are willing to spend more, but still need a low-range air purifier. Well, it is nice to have a lifetime warranty for an only $199 Alen T500, right? That’s truly the selling point of Alen, because with $199, they put their Alen T500 directly into a massive competitive segment. That price is around the same with the Levoit LV-PUR131 and Coway AP-1512HH, which are unquestionable great for customer services, too. I don’t want to list a series of competitors, but keep in your mind, the list is longer more than you can imagine. With $199, the Alen T500 can be replaced by Alen Paralda for having new air flow approach. But we are here because we want to know the Alen T500, so let’s save one deal for this air purifier first. Alen T500 Tower Air Purifier with HEPA-Pure Filter for Allergies and Dust, Black Edition. The Amazon’s Choice for Allergies, with Room coverage up to 500 sq ft. Lifetime Warranty. The Alen T500 has a very similar appearance to the previous T300, but for most of Breathe Quality’s readers who search for an Alen device the first time, I will describe it thoroughly. Being the middle between T100 and T300 (funny, isn’t it), Alen T500 has a very classic design that matches the first tower air purifiers from, yep, all other American brands. The Guardian Technologies has GermGuardian AC5250PT and the Honeywell comes with a Honeywell HFD-120-Q. Testing and using air purifiers for many years, even me can’t tell the different if just glance at this Alen T500. Standing tall with 22 inches in height, the Alen T500 is the same size with the compact GermGuardian AC4825. Also with only 9 lbs in weight, this air purifier is portable and convenient to move around. Alen has made a $39 travel bag for only this Alen T500, so you can easily pack it up and bring it with you anywhere. I have not tested the travel bag, because it is not included in our sent air purifier, so you need to search for the Alen T500 Travel Bundle to get this bag. Our Alen T500 is a true tower air purifier with the classic design for back-to-front air flow concept. That being said, we have one big air intake grill from the back and the opposite air outlet grill. This concept is useful for tower air purifier, providing that they don’t have the ridiculous panels like some of GermGuardian air purifiers. On the top is the intuitive LCD Screen controls with 4 basic function buttons to help operate the Alen T500 easier. The curved head gives me the feeling of similarity to the GermGuardian AC4825, but I don’t think they’d be important to compare. Personally, I don’t enjoy this top control, which is hard to push the buttons. If I need to choose one, the design of Honeywell HFD310 is much better. There are many panel color options available for you to choose, from the basic Black and White versions, to the distinctive and special from the both sides: Black Espresso, Black Oak, Black Rosewood, White Maple and White Oak. Our testing unit is the Black edition, but you can get others from Amazon as well. As the decisive criteria for the performance of one air purifier, by default we look at the quantity and the quality of its air filters, and what the air filter types are using. Alen T500, along with most of other Alen air purifiers, has a 3-stage air filtration system. The first layer is a washable pre-filter, while the second stage relies on a HEPA air filter. 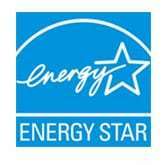 There are 4 different HEPA air filters to choose from. HEPA-Pure – The standard HEPA filter of Alen T500, which is able to capture 95% of as small as 0.3 microns pollutant particles such as dust, dust mites and pollen. HEPA-OdorCell – The ultimate level HEPA filter of Alen T500, using the ultimate Alen’s Molecular Conversion Powder. This air filter is the final defense against all allergens as well as smoke and pet odors. Let’s talk about the 3-stage air filtration system of Alen T500. 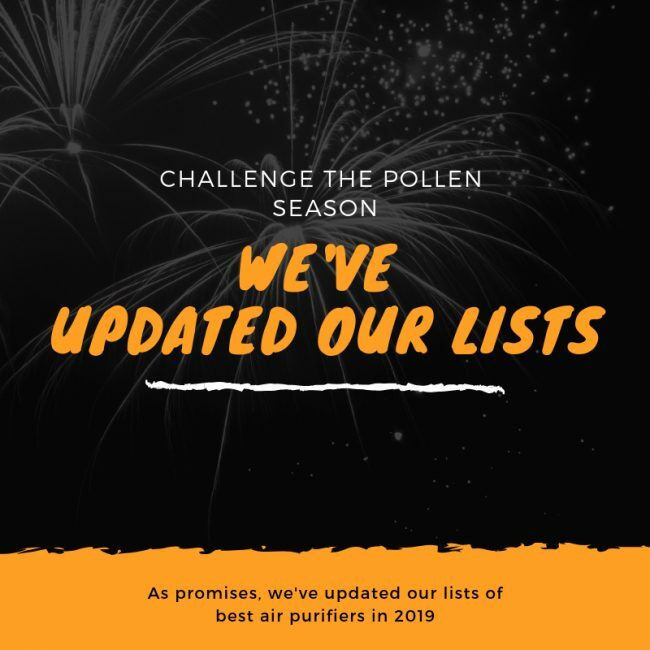 The polluted air first needs to pass through a washable pre-filter to capture large particles like large dust and pet hair, which is permanent to use and able to extend the life of the HEPA filter. Next stage, while having 4 different levels of HEPA air filter to choose, here’s where the Alen T500 starts to fall down. Alen T500 only uses a HEPA filter, not a True HEPA filter, that is only capable of dealing with 95% of any as small as 0.3 microns in size particles. While the HEPA filter is great, after all it is certified to guarantee the purification, I’ve encountered performance issues with the Alen T500. The last stage, we have one ionizer which is used to increase the efficiency of the HEPA filter. However, it doesn’t help many. I’ve found that some intensive activities have proved a struggle for the Alen T500, and whatever I turned the ionizer on or off, the efficiency of this air purifier remains the same. For a $200 air purifier, you can expect much more from others like Levoit LV-PUR131, Coway AP-1512HH and Honeywell HPA200. They offers better True HEPA filter, and better fan power as well. Testing performance for Alen T500 is an easy task. To compare, I used two samples – the Coway AP-1512HH and Honeywell AirGenius 4 HFD310. While the first is running a True HEPA filter, the second has an unique ifD air filter, which is nearly the same as the air filtration system from the Alen T500. As the result, we have a clear winner for Coway AP-1512HH, with a high efficiency of trapping 99.95% as small as 0.3 microns particles. The Honeywell AirGenius 4 has an efficiency of 83%, while the Alen T500 drops to only 79%. My testing conditions: All air purifiers run in 200 sq ft, for a full hour. You can’t really expect more from a HEPA-type air filter, but I am a little disappointed for the price, Alen still refuses to use the certified True HEPA filter on their air purifiers. Furthermore, the air filter cost is not cheap. For the first level of HEPA-Pure, the air filter cost starts at $44 for a single pack. The HEPA-OdorCell is up to $89, and whether I choose the $45 from Coway AP-1512HH or $49 from Honeywell HPA200, it is much better, plus that is the price tag of a True HEPA filter. Plus the air filter only lasts for 6 months, the annual filter cost of Alen T500 is actually higher. Overall, though, I expected better from the Alen T500. It’s far from unusable, but I’d hoped for a slightly more in terms of performance. Room coverage on the Alen T500 is nothing to write home about – if anything it’s a little bluffing. The room coverage in the manual is 500 sq ft, but I will tell you why the air purifier is insufficient for that number. The ACH of Alen T500 is from 1X to 5X. Alen T500 has better air changes per hour for a very smaller room size, just 79 sq ft. If you use the Alen T500 in a room of 500 sq ft, it will only clean your room once per hour. The CADR of Alen T500 is 159 cfm overall. There is no need to tell you that with such low CADR rating, the Alen T500 is really insufficient for such large room as 500 sq ft in area. 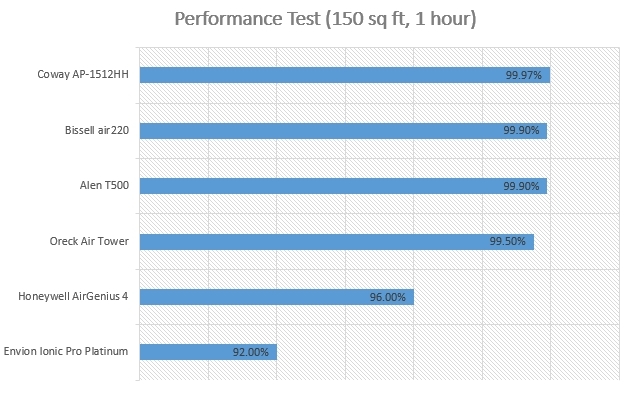 The CADR rating is still better than the Levoit LV-PUR131, but is lower than any other $200 air purifiers. However, it is not for, at least, the Alen T500. Even without an impressive fan power, the Alen T500 makes lots of noise. In the lowest fan speed, we have a tolerant noise level of 42 db, which is a little bit higher than the standard library noise level, but it is still okay to me. Once you switch to the highest setting, the table is turned. The noise level of 130 db is unexpected high for every air purifier, and Alen T500 even add the crackling noise from the ionizer to make things worse. For your information, 130 db is exactly the noise level of military jet aircraft when taking off. This is annoyingly loud to some people, and 64 times louder than even the noise level of a car. If you are running this air purifier in quiet places, I totally don’t recommend it. Alen T500 has an average power consumption, with the maximum not above 53W. The power consumption of Alen T500 is stable, and if you know the Honeywell HPA200 consumes 84W for the same price, you may have more good feeling toward this Alen T500. For using a Alen T500 8 hours per day, it would cost you about $20 per year. The company makes the Alen T500 to be the budget device among the army of Alen air purifiers. That’s why you can’t find the latest modern features like Smart Sensor and Smart connectivity, which are common in the $200 GermGuardian CDAP5500BCA or Blueair Sense +. But again, many air purifiers within the price don’t have Smart features, either. Fortunately, we are having a necessary Timer and LED indicator for filter replacement. These basic features are truly needed to have one air purifier operate smarter. But yes, you only have these additional features when buying an Alen T500. I know, there is always something you don’t think you’ll miss until you lose it. For the price, I believe that the Alen T500 doesn’t deserve. It doesn’t come with a True HEPA filter, has a weak fan power and is very noisy. 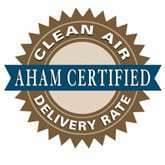 But Alen is the top 1 candidate for the best air purifier customer service in the world, and you should never take it lightly. Should I buy Alen T500? No, the Alen T500 will be dead soon, I suppose. It is too noisy to handle. 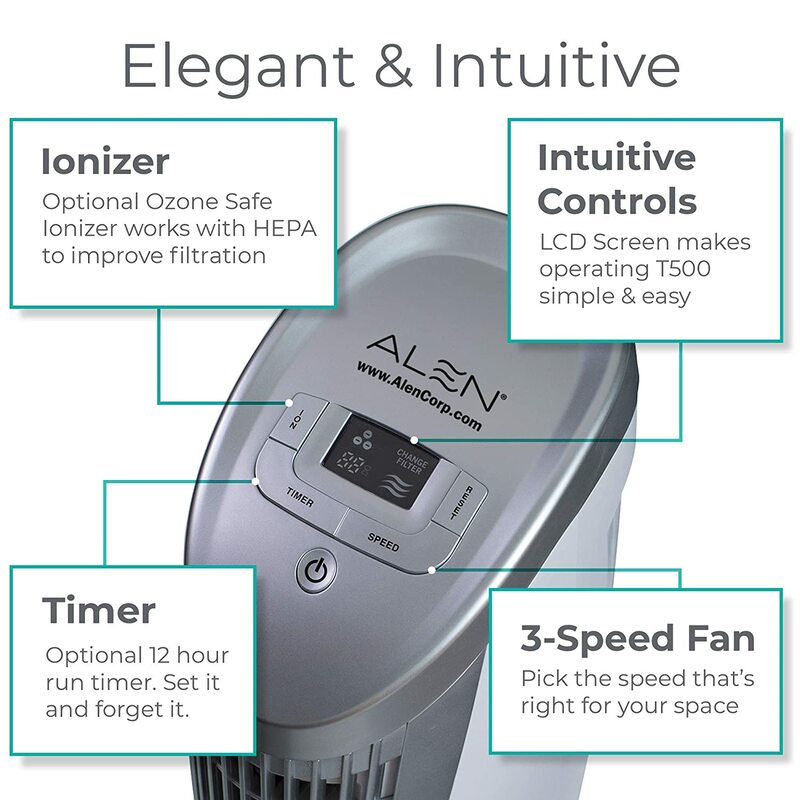 If you have serious allergies or asthma to airborne pollutants: the Alen T500 is not the greatest device with only a HEPA-type filter. You should choose between the Honeywell HPA300, Winix 5300-2, Winix C535, Winix 5500-2, Levoit LV-PUR131, Coway AP-1512HH or AeraMax 300 for a better air filtration system. If you need a more silent air purifier: you should buy the Winix 5300-2 or Levoit LV-PUR131 to enjoy the silence. The Alen T500 is the noisiest portable air purifier I’ve ever tested. If you care about the annual filter cost and energy cost: you should not buy this Alen T500. The Levoit LV-PUR131, Honeywell HPA200 or Winix 5300-2 won’t cost you as high as the Alen T500. Good for the brand, not for the air purifier itself.